These are the easiest, most portable breakfast treat I’ve made. 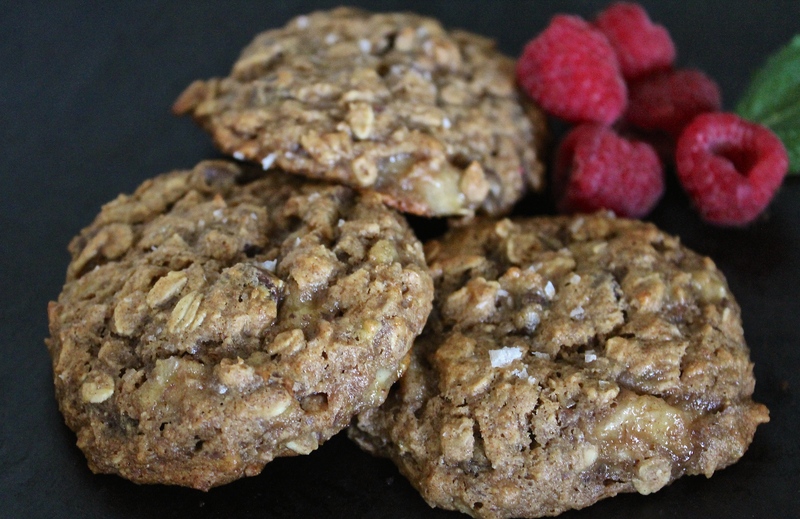 These cookies are healthier than a typical breakfast cereal, yet just as attractive to little people. Mine barely let me take this photo as they were counting the minutes until they came out of the oven (they smell delicious). These treats received an all thumbs, fingers, and toes UP sign. And I give them two thumbs up because they are full of nutrients like potassium, which protects our cells, balances our bodily fluids and electrolytes, and helps us maintain a steady heartbeat. Bananas are also a great source of fructoogliosaccharides, which feed the good bacteria (probiotics) in our guts to keep us healthy and strong. Preheat oven to 350 degrees. Place a sheet of parchment paper on a cookie sheet and set aside. Combine banana, nut butter, honey, and vanilla. In another bowl, combine the oats, flour, flax seeds, buttermilk powder, cinnamon, and baking soda. Stir the dry ingredients into the wet ingredients. Add the chocolate chips. Drop 1 1/2 tablespoons (I used a medium cookie scoop) on the prepared cookie sheet for each cookie. Sprinkle the tops with a tiny bit of sea salt flakes. Bake for approximately 15 minutes. You can freeze these cookies for up to 2 months – if you happen to have leftovers! On day 16 of this 365 day project, I ate my daily five. Did you enjoy yours? p.s. The inspiration for this recipe was found in the cookbook “The Best Homemade Kids’ Lunches on the Planet.” Thank you, Laura Fuentes! loving your blog, kristen! my girls would love these. when you say “rolled oats” can i use old-fashioned or is there another kind i should be using? I’ve made these 3 times in 4 weeks. My 7 year old, Mac, worked side by side with me this time making them taste even better. To make ours dairy-free, I replaced the buttermilk powder with flour. So delicious. Thanks for sharing, Kristen!